Several weeks ago the cool wet weather brought on some red thread disease activity that has increased over the past 4 to 5 days. Turfs under low maintenance, particularly low nitrogen fertility, have been the areas with the greatest amount of red thread. This disease has been active on on slender and strong creeping red fescues, Chewings fescue, velvet bentgrass, perennial ryegrass, and tall fescue this spring. Red thread has pink to pale read sclerotia or fungal thread-like growths that resemble antlers and can extend 1/4-inch or more beyond the tips of leaf blades. 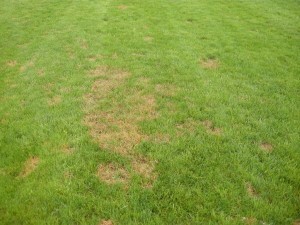 Turf can be encouraged to grow out of this disease by applying a low rate of nitrogen fertilizer. Traffic on turf tends to disrupt activity of this pathogen on turf. Rutgers Cooperative Extension Fact sheet FS798 has more information on red thread and pink patch diseases.